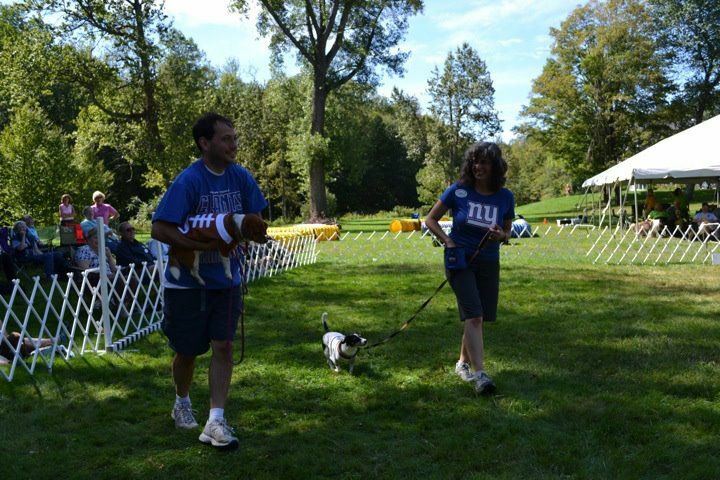 Larry, Kathy, Scraps and Rags show their Giants pride at the beginning of this season at dog camp. Just one last week for me to superstitiously wait until Sunday morning to write about the week’s Deadstein jam. Much like Deadstein’s monumental run of over 20 decade of playing Grateful Dead music, the New York Giants are on their own run which finds them in Indianapolis, playing on this Superbowl on this Super Sunday. Deadstein and the Giants have been riding this wave of “pos” all the way from the bowls of defeat in Dallas to a chance to bring the Lombardi trophy home tonight. Let’s Go Giants! The first time the Giants won a Superbowl in 1986 they defeated the Denver Broncos and that is where I think Brotpen was for the week. Without Rich in the area means a slightly discombobulated Deadstein and that is what we had this week. We reached out for a keyboardist but couldn’t find any. Scott reached out to an old high school friend of his, Rob from Seaford, who he hasn’t seen in 30 years but they are friends on Facebook. Rob was in town and agreed to take Scott’s offer to jam and he showed around 9:30, about an hour into the jam. The jam was different because we were at Montana’s with all of it’s goodness, as Carroll’s didn’t have any room for us this week. We started with a little, not so Core-4, with Alan who was back with us after missing 2 weeks jamming with some other band. He arrived with his shiny new VG-Strat with guitar modeling and blue light. For me, I am still actively trying to complete release 8 of the Jerry Garcia Song Book and brought in with me a loose-leaf binder containing the draft of the new book. This got me to try a Money Honey as a new Deadstein song, which was really good. The new book is going to be a nice addition to our jams once it comes out, I can’t wait. When Rob arrived, I realized he was a guitar player and not a keyboardist. Additionally, Rob played in a Paul McCartney cover band back at his home by Albany, so he was well versed in some of our packet. Since we didn’t have anyone playing piano and we had 3 guitarists and a vacant keyboard, I decided to play keys for the remainder of the night and let Rob do what he does so well. I think it was a good decision, I was challenging for me and a lot of fun. I haven’t touched any keys in months and I was very rusty. Nevertheless, I was able to grove and add to the experience of the music, so I think. Without having Rich there with his MP3 recorder, we don’t have MP3 to listed to but the setlist is provided below. Fortunately, Scott is a crazy video taper these days and had his camera and used that to capture the jam. A few songs are available as the embedded YouTube video. Enjoy and go Giant’s!